Here is a picture of former tourism minister in Haiti Stéphanie Villedrouin who has been nominated as Young Global Leaders (YGL). The outgoing Minister of Tourism Stéphanie Villedrouin has been nominated at the World Economic Forum as a Young Global Leader (YGL). The Forum of Young Global Leaders is a unique and diverse community of the world's most outstanding, next generation leaders. On March 18, 2016, the World Economic Forum released the names of the 121 laureates, selected among the business leaders, social activists and artists, aged under 40, who have contributed and influenced on the policy, society and the world around them. More than half of the YGL are women and the majority are from the emerging economies. 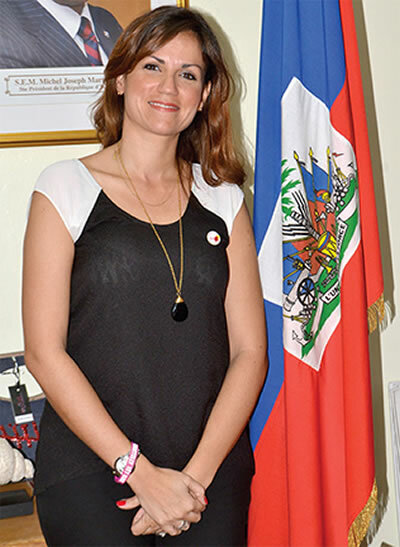 Stéphanie Balmir Villedrouin, as the minister of Tourism has worked amidst corruption, poverty and challenges for the revival of Haiti's tourism industry. She has been regarded as one of the most visible figures of Haiti's different Ministries. She never remained contented with the accomplishment of tourism objectives during her tenure, but has worked to create infrastructure that will ease tourism in Haiti in decades to come.